Popular Archaeology has an interesting report on some work done by Roger Larsen of Columbus, Mississippi to demonstrate how large stones can be moved by only a few people with simple ropes and levers. Larson has put video of his method up on YouTube. One of the nicest bits of tech showcased here is the "Isis Knot", as Larsen calls it. Rather than being a complicated fastening of multiple lines, each line terminates in a very simple, very solid knot. The central winch line has similar knots along its length, and the lines are connected by a smaller bit of twine wrapped around them (see illustration). 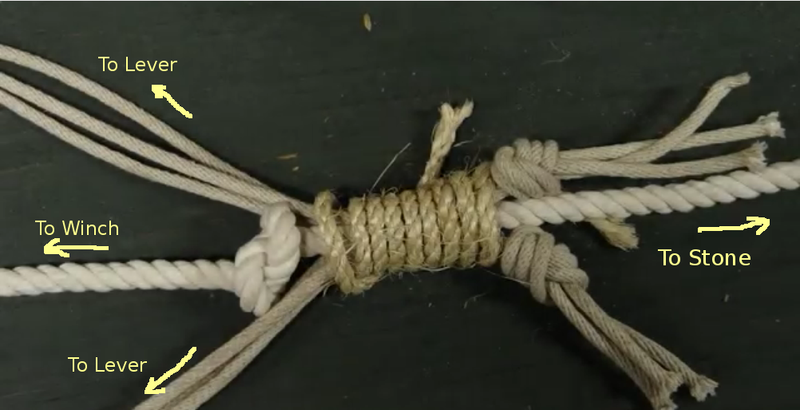 The purpose of this knot is to allow the levers to gain purchase further down the rope while steady tension is always maintained by either the winch or the levers. The majority of the force of pulling is vectored along the winch rope, causing the knots to interfere and brake the load.a very small bit of force is exerted by the wrapping twine to make this happen. Larsen mentions that those who used such a process regularly would doubtless be better at it, and I agree. For instance I can immediately see where his procedure can be easily streamlined by putting a knotless loop in the center of the wrapping line, passing both loose ends through the loop, and pulling it tight. A number of other quick fasteners could be used. 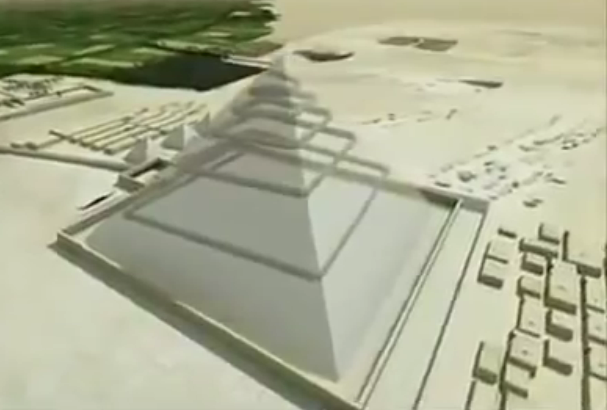 Larsen believes that this method would allow the sides of the pyramids to be used as ramps (though I favor Jean-Pierre Houdin's speculation about an internal ramp. It's important to remember, though, that it's not necessary for all of the blocks in every tier of a structure to be raised by the exact same method. As with my own conjectures, the purpose of relating Larsen's experiment here isn't to say this is how the Egyptians did it. Rather, it's to demonstrate that it's possible for them to have done it, in response to the terribly unimaginative few who would discount the native ingenuity of our ancestors in favor of wild speculation about aliens and magic. Basically, these people can't think of reasonable, workable ways to complete a task, so they resort to "it must be magic" when genuine consideration fails them. I don't find such thinking to be terribly smart, by any measure. BTW, you can see more about Houdin's investigation into an internal ramp on YouTube.